to wear than neoprene, thus appropriate for long term wear or wear in warm climates, and ideal for wearers who are allergic to or irritated by neoprene fabric. This heavy duty, controlled stretch knee brace provides protection and added stability for post-surgical recovery, or for those individuals with a history of joint instability. The rigid hinged metal bars provide excellent side-to-side support, yet allow for free flexion and extension. 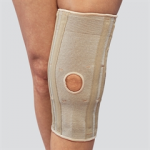 The elastic sleeve supports the entire knee area and helps reduce painful swelling. This is an excellent product for everyday activities like mild exercise and walking. This is a heavy duty, controlled stretch knee support that helps reduce swelling and minimize pain while allowing full range of motion. 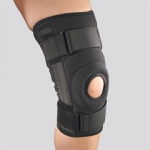 Dense foam support pads on either side of the kneecap add stability and help maintain proper alignment. The medial and lateral spiral stays bend with the knee, and help keep the elastic material fully extended, and enhance wearing comfort. This is an excellent support for post-surgical recovery. It helps reduce the incidence of reinjury while active.